It’s day 3 of 8 of Passover and I have been hit by a massive wave of matzah-fatigue; egg matzah, chocolate matzah, matzah brei, you name it – I’ve eaten it. So, if like me, you are hankering to chow-down on some Passover-restricted grub, or indeed you’re just trying to steer clear of carbs/gluten/extra calories, then you have come to the right place. 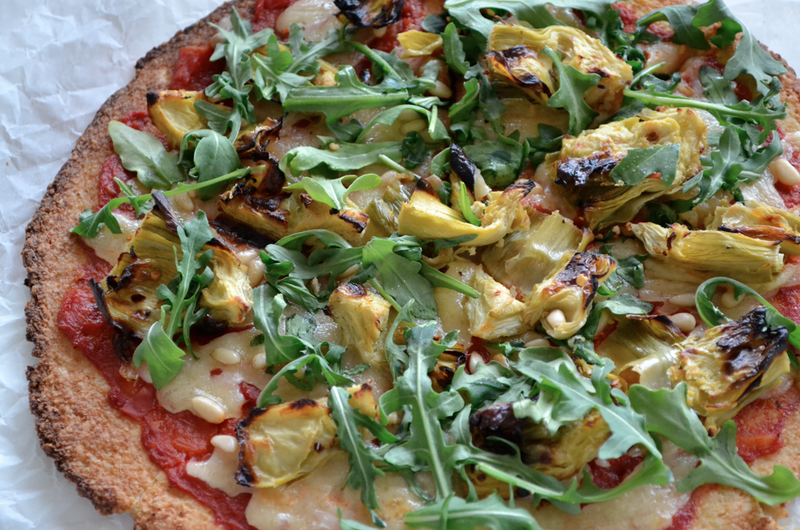 Let me introduce you to the flourless pizza base – aka “The Cauliflower Crust”. I won’t lie to you – do not expect a fluffy doughy pizza base. 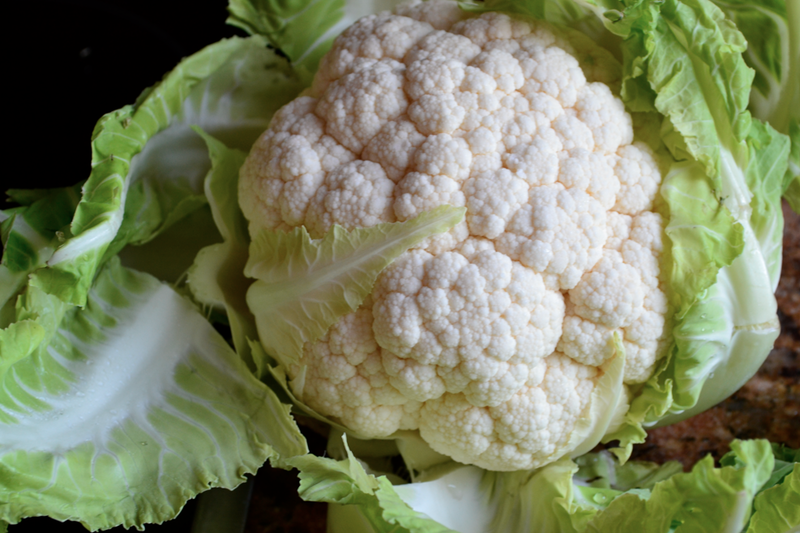 This version is a little nutty, a little cakey and a little bit more like a giant cauliflower fritter than Domino’s finest, but it is a deliciously worthy carb-free substitute and provides a perfect base for all of your favourite pizza toppings. Today I went with a combo of grilled artichoke hearts, fresh rocket and pine nuts, but the possibilities are endless – why not use pesto instead of tomato sauce and top with mozzarella, tenderstem broccoli and chilli. Start by pre-heating your oven to 180°. 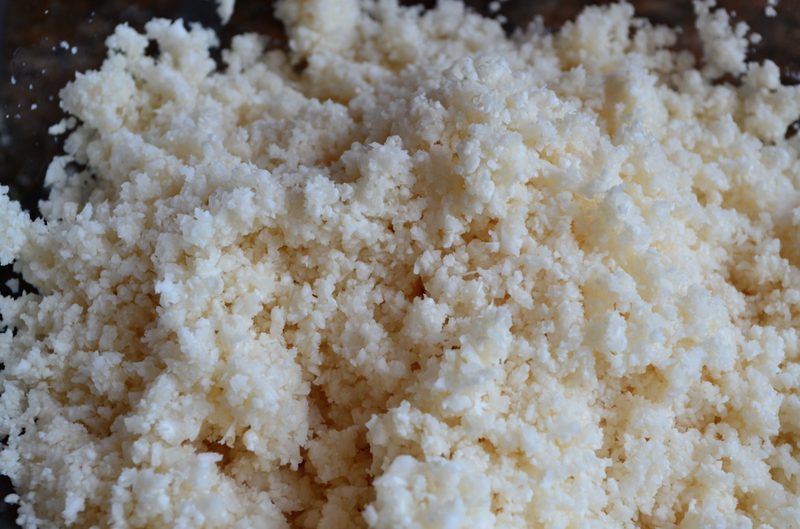 Next, pulse the cauliflower in a food-processor until it looks almost like cous-cous. Tip out into a large bowl, add the remaining ingredients and mix together. Don’t worry if the mixture is quite wet – the consistency is going to be very different from a normal dough made from flour. Take half of the ‘dough’ and loosely shape into a ball. On a baking sheet lined with greaseproof paper, gently flatten the ball into a circle just under 1cm thick. To ensure it’s crispy, the base must be cooked before you add the toppings. It will need around 20 minutes – until it’s golden. At this point you can add your toppings and then whack it back in the oven for 5min or so – just enough time for your cheese to melt. 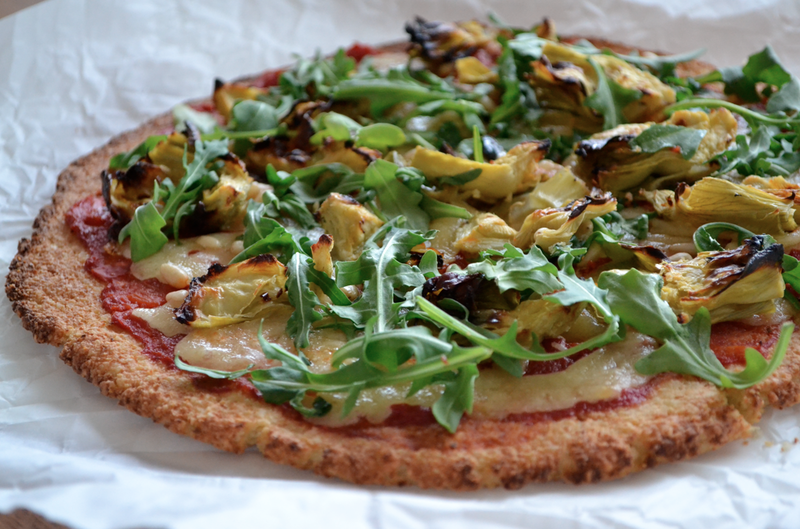 Try my ultimate tomato sauce on your cauliflower crust pizza. I’ve now made this twice and absolutely love it! To say I’m looking forward to next Passover would be an exaggeration but at least I’ll have something other than matzah to eat when the time comes around. Made this but with broccoli instead, (it was in my fridge) and flour instead of ground almonds because my OH has a nut allergy. It was yum.